An unverified photo shared on social media claims to show the crash where over 30 schoolchildren were killed when their bus crashed into a ravine near the Ngorongoro conservation area. Update – 20:45: The death toll in the crash now stands at 33 children. Two children are reported to be in critical condition. A bus crash killed 32 children, 2 teachers and a driver crashed in northern Tanzania on Saturday, May 6. The standard seven students from Lucky Vincent primary school in Arusha were travelling to take a mock exam at another school. 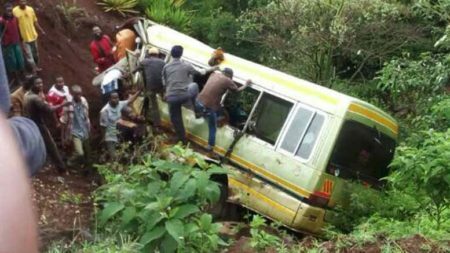 Their bus crashed into a ravine near Karatu, northwest of Arusha, near the Ngorongoro conservation area. Photos shared on social media showed the bodies of over a dozen children in school uniforms gathered on the side of the road. The BBC reports that several passengers survived.